"An easy and moist recipe for delicious pork loin chops." Place meat roasting rack in shallow baking dish or roasting pan. Place chops on rack. Salt and pepper to taste. 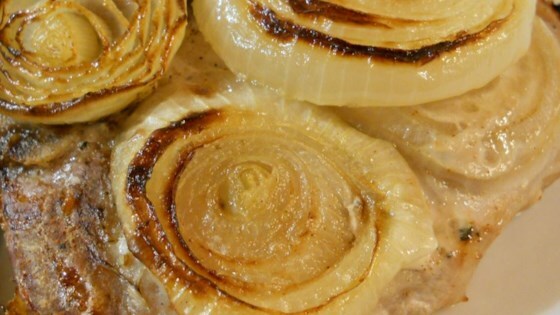 Cover chops with onion slices. Pour water in bottom of pan, be sure it is not high enough to touch the chops. Cover with foil or tight lid and roast for one hour. Cut into one chop to check for doneness. When chops are done all the way through, remove foil or lid and return to oven for 15 to 20 minutes to brown slightly. Watch carefully during browning. We loved this quick & easy recipe. The second time I made this dish I seasoned chops with garlic salt in the morning which gave it more flavor. Instead of water, I used beer and worcestershire sauce for added vest. It turned out great! Use your favorite spices to add a little zing to it! You do have to add some of your favorite spices to tinker it to your liking. As it stood for us...we needed more flavor. It is a great recipe, but just make it your own.